"Enter a world of seafaring captains and historic grace as you walk through the doors of the Admiral Fitzroy Inn." The Admiral Fitzroy Inn is where guests enjoy the privacy of our comfortable guestrooms and convenience of walking to all that Newport’s harbor front district has to offer. 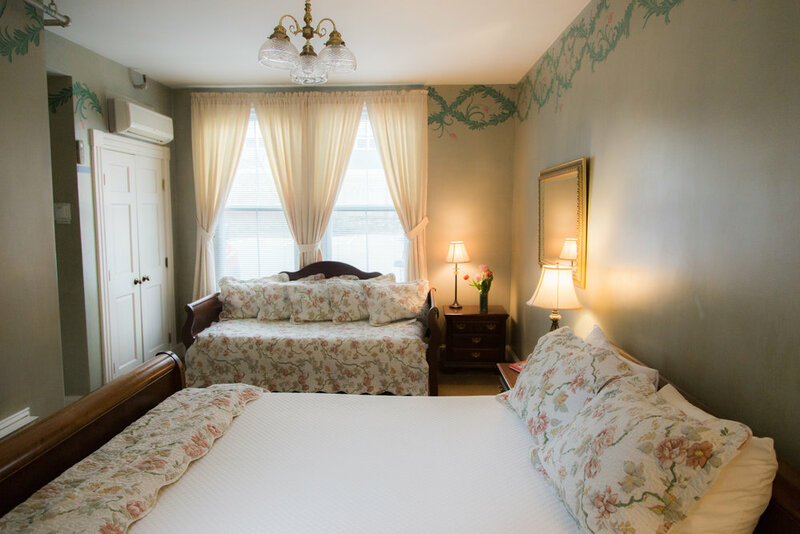 Centrally located on Thames Street, our friendly bed & breakfast is just a few quick steps from the best restaurants, shopping, and popular attractions in Rhode Island’s city by the sea, making your overnight excursion, romantic anniversary celebration, or an extended stay away from home, easy, comfortable, and carefree. Built in 1854 to designs by renowned architect Dudley Newton, the historic property is on the National Register of Historic Places. The Inn had its first home two blocks away on Spring Street where it served as the convent for the sisters of St. Mary’s Church. After local entrepreneur Don Glassie bought the building in 1986, it was dismantled and moved to its current location on lower Thames Street then rebuilt to its original size and style standing tall and proud in Newport’s waterfront district. The Inn is named for a famous English Admiral and meteorologist who commanded the H.M.S. Beagle on Charles Darwin's expedition that inspired the Origin of the Species. Admiral Fitzroy was one of the first to attempt a scientific weather forecast. Returning from his famous journey with Darwin, he took up the newly created post of Head of Meteorology at the Board of Trade in London and began collecting the information necessary to predict the weather. Working on this knowledge, Fitzroy created the first easy-to-use barometer, leading to the first daily weather forecasts published in The London Times in 1860. The Admiral Fitzroy Inn is pleased to announce that it has recently acquired an antique Admiral Fitzroy Barometer which is proudly being displayed in the lobby. Why stay at the Fitzroy? "A perfect place to stay when vacationing in Newport." "You won’t do better in Newport than the Admiral Fitzroy. A friendly and helpful staff, extensive continental breakfast and perfect location make the inn our favorite location in Newport. Angela, the innkeeper, went above and beyond to help us when we had car trouble. Couldn’t be happier with our stay!" "What a special place. I can't wait to go back. Staff super friendly. Rooms cozy and clean. Great location with ample parking. What a gem. Thank you for the pleasant stay. This hotel is right in the middle of Newport literally within walking distance of super restaurants, shopping galore . A short drive to the Mansions, the cliff walk and Jamestown. Book ahead of time in busy season, because it most likely will be sold out. Oh yes. The breakfast was phenomenal. Best croissants ever, fresh fruit, oatmeal, basically anything you might want." "This past August was our third year in a row at the Admiral Fitzroy. We love it more and more each time we return. The people and place are terrific and the location is fabulous. We will be returning this year as well!" Read More Guest Reviews on Trip Advisor! How close are you to the mansions? The mansions are anywhere from 3/4 of a mile to 2 1/2 miles away along Bellevue Avenue. It is quite a nice walk to head down Memorial Blvd., then take Cliff Walk along the back side of the mansions, all while remembering that you must walk the same distance back to the Inn! Alternatively, you could access the mansions via Bellevue Avenue. Each mansion has very convenient parking, which we recommend taking advantage of. We recommend that beach lovers check out Easton's Beach, known to the locals as First Beach. You can drive here and park for a fee (about $15-$20), but if you have more than a beach towel and sunscreen, then it's quite a walk! Can you walk to restaurants and shops? Yes! The most popular Newport restaurants, such as The Mooring, Brick Alley Pub, Mamma Luisa, Bouchard's and more are right outside our front door. Yes, parking is complimentary and once you park your car here, you may find that you don't really need it! We call it our signature continental. You will find fresh baked goods such as muffins, sweet breads, scones and croissants, plus a hot ham & cheese croissant option. We also feature select cheeses, yogurt, granola (custom-made for the Inn! ), hot and cold cereals, fresh fruit salad, assorted juices, coffee and tea. No one has ever left our breakfast hungry. Do all of the rooms have private bathrooms? Yes, all bathrooms are private. Other amenities include refrigerators, cable television, free wireless internet and air conditioning. Yes, the elevator goes to the third floor. Our rooftop deck is located on the fourth floor, accessible by stairs only. Do you have harbor views? Our rooftop deck has partial water views and a couple of the rooms on the third floor have a partial water views as well. Why should I stay at the Admiral Fitzroy Inn? The Admiral Fitzroy Inn is a great value and features friendly, knowledgeable staff, with the best location in Newport. We also have freshly baked cookies in the lobby to fuel your vacation sweet tooth. To find out what guests have to say about the Inn, visit our TripAdvisor page.